Frank Karlitschek, founder of Nextcloud and recipient of this year's Reinhard von Koenig award. 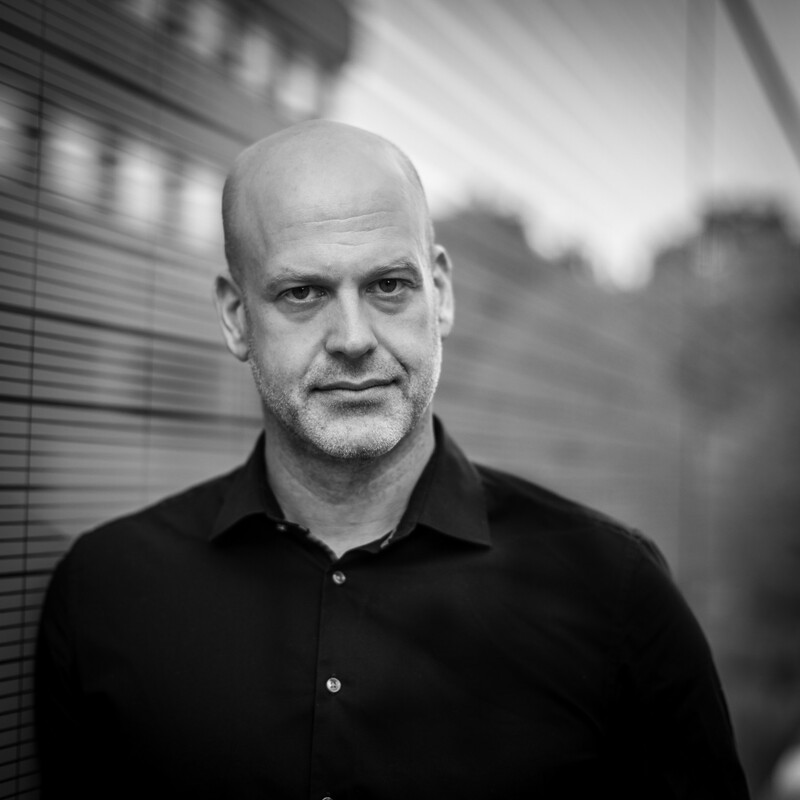 Frank Karlitschek, the founder of Nextcloud, has won the Reinhard von Koenig award and will be donating the winnings, amounting to € 20,000, to start a fund called "Nextcloud Include". The fund, set up in collaboration with KDE e.V., wants to encourage diversity in open source. It aims to help underrepresented groups participate in the global Nextcloud community and foster an inclusive and diverse space where the community can continue to collaborate and develop world-class software. Mentoring, travel support, and internships are provided as part of the program. The program is ran in collaboration with the KDE community under the umbrella of the KDE e.V. Equal opportunities and diversity are very important issues for the future, especially in technical professions. I am pleased that Nextcloud Include is a new important initiative that is focusing on these issues". I'm extremely honored to be awarded this prize as a recognition of the incredible impact privacy issues have on our society and the importance of Nextcloud in providing a solution. By donating the prize money to a diversity goal, I hope it will help catalyze another transformation that society needs". We'd like to congratulate Frank on winning this prize and his decision to put the money to a great cause in open source. For us, collaborating with Nextcloud in this way is a bit of a homecoming as it is one of the most successful projects to emerge from our community over the past decade". It is worth remembering that Nextcloud started life as a KDE project. Nextcloud, Frank and KDE would like to invite community members who want to get involved in Nextcloud but face significant social hurdles to get in touch with our Include team. You can find more information on Nextcloud Include page. The Reinhard von Koenig award promotes excellence in progress and technology. Previous winners include notable staff members from Daimler AG and Atlatec GmbH for work on self-driving cars. If you missed any of the talks, or couldn't make it to Vienna to attend this year's Akademy, now you can watch the recordings from the comfort of your home. You can find and download the videos from our repository, or browse and share them from the YouTube playlist we have set up especially for all Akademy 2018 videos. For most of the year, KDE -- one of the largest free and open software communities in the world-- works on-line by email, IRC, forums and mailing lists. Akademy provides all KDE contributors the opportunity to meet in person to foster social bonds, work on concrete technology issues, consider new ideas, and reinforce the innovative, dynamic culture of KDE. Akademy brings together artists, designers, developers, translators, users, writers, sponsors and many other types of KDE contributors to celebrate the achievements of the past year and help determine the direction for the next year. Hands-on sessions offer the opportunity for intense work bringing those plans to reality. The KDE Community welcomes companies building on KDE technology, and those that are looking for opportunities. Tuesday continued the Akademy BoFs, group sessions and hacking. There is a wrapup session at the end of the day so that what happened in the different rooms can be shared with everyone including those not present. 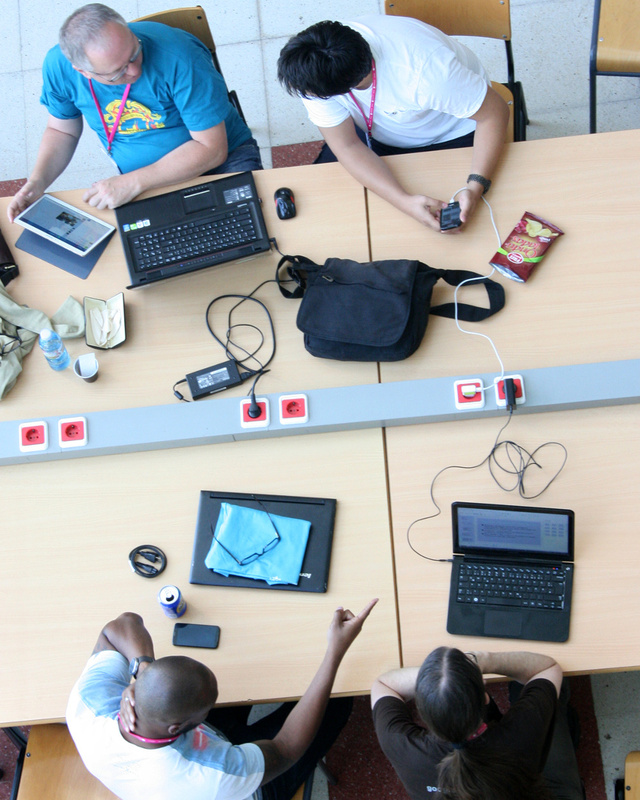 Monday was the first day of Akademy BoFs, group sessions and hacking. There is a wrapup session at the end of the day so that what happened in the different rooms can be shared with everyone including those not present. Claudia Garad, Executive Director of Wikimedia Austria, reflects on the challenges of inclusivity. Day 2 of Akademy started with a wonderfully insightful keynote by Claudia Garad, the Executive Director of Wikimedia Austria. She focused her talk on some of the challenges that organizations like hers face when trying to bring about more inclusivity and diversity within their communities. 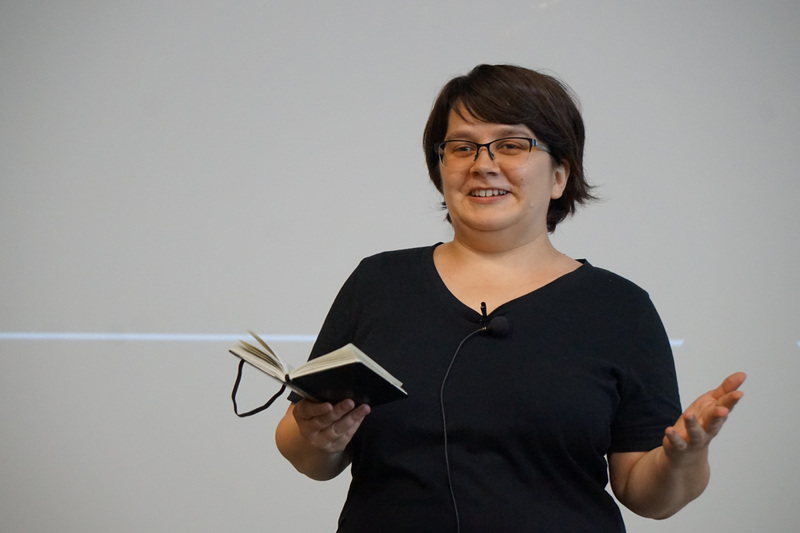 She emphasized the importance of making underrepresented communities feel more welcome and heard within the organization, then went on to speak about how she perceived KDE as being quite ahead of Wikimedia in some aspects, especially when it came to reaching these goals. One of the things she thought brought a positive vibe to the KDE community was that "KDE embraces cuteness", she said while displaying a slide with the "pile of Konquis" picture. On a more serious note, she said that through events such as Akademy, sprints and events around the world, you can bring together people from immensely diverse backgrounds and have them work towards building a stronger community. Speakers covered a wide variety of topics in the afternoon. Alan Pope from Canonical, for example, told us about Snapcraft, a web-based tool that makes it incredibly simple to build a Linux package out of code just pushed onto git. Meanwhile, Oliver Smith, the project lead of postmarketOS, spoke about the experimental phone OS based on Alpine Linux and plans for integration with Plasma Mobile. Volker Krause showing off Plasma Mobile running on Yocto on a Raspberry Pi-powered device. Meanwhile, David Edmundson was not only predicting where KDE's Plasma desktop would be going next, but also numbering the potential pitfalls it would have to avoid on its way getting there. One of the things in store for Plasma users is full browser integration. Kai Uwe Broulik explained what is working (quite a lot), and how you will be able to control every aspect of your web browser with Plasma's integrated tools. 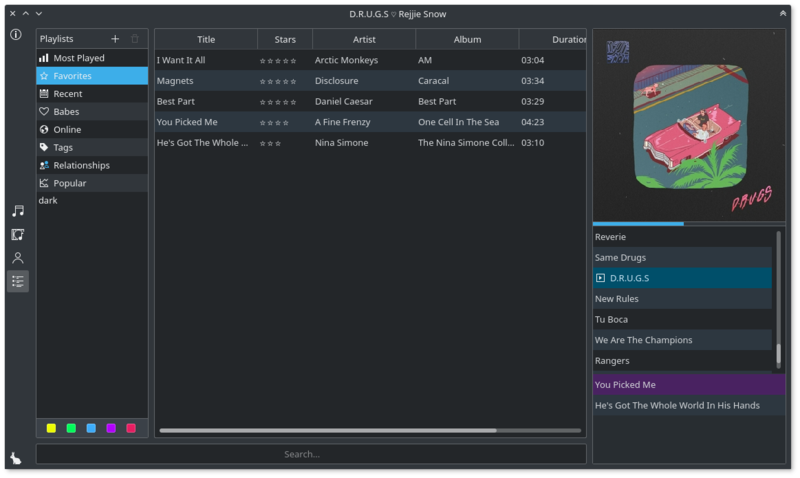 Already working are controls for playback of videos and music on many popular sites using desktop widgets, including the likes of KDE Connect. Talking of playing music, Camilo Higuita told us about the progress of VVAVE, a next generation audio player that is fully convergent (it integrates both with your Plasma desktop and on your mobile phone), and is but one part of Camilo's idea for an open audio streaming service. Andreas Cord - Landwehr gave a talk on Yocto and how to use it to build images and SDKs and to create KDE-powered devices with Yocto. In a a similar vein, Volker Krause showed of a Raspberry Pi-based device running Plasma Mobile also on Yocto. The excitement of the KDE developers when it comes to running KDE software on mobile devices is electric and the audience was buzzing during these talks. The day ended with Sponsor Talks by The Qt Company, BlueSystems, Canonical, openSUSE, CodeThink, and Mycroft. From left to right, Valorie Zimmerman, David Edmundson, and Aditya Mehra with their own awards and those that couldn't attend. 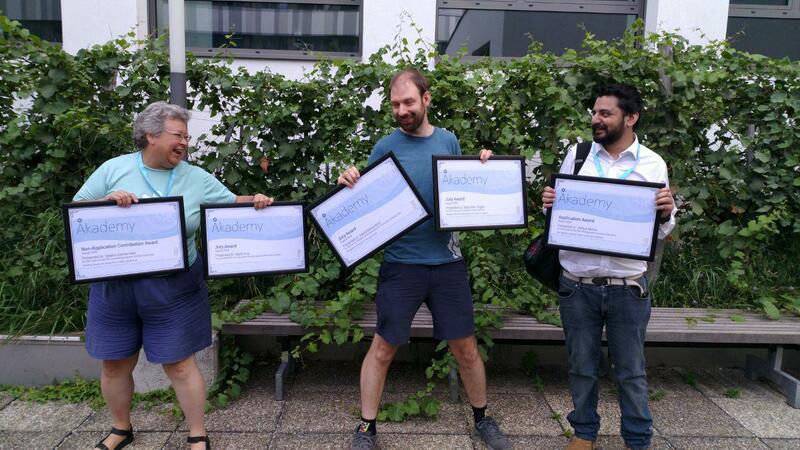 Finally, there were the Akademy Awards ceremony. The Akademy Awards are a way of honoring members that have done outstanding work for the benefit of the whole community. The Application Akademy award went to Aditya Mehra for their work on the Mycroft integration providing KDE with a free speech assistant which is free as in freedom . There were three Jury awards this year they went to Sebastian Kügler for for their many years of relentless hacking and more (Plasma, KDE Marketing, years in the KDE e.V. Board), David Edmundson for their work on Telepathy, porting applications to Frameworks 5, Plasma, KWin, KWayland, and being the crazy guy around and to Mario Fux for supporting KDE over many years through organizing the Randa meetings. The Akademy Team were thanked with the Organizational Award to Stefan Derkits and the whole team responsible for putting together Akademy 2018. Congratulations to the winners and thank you for being so awesome! Lydia Pintscher, President of KDE e.V. opens this year's Akademy. Photo by Paul Brown, distributed under the CC0 license. Dan Bielefeld, the Technical Director of the Transitional Justice Working Group, explained the work they do to map North Korean locations of mass burial and execution sites using mapping technologies. He also delivered insight into how North Korea and the Kim regime operates, and how his organization gleans information both from interviews with refugees and from studying satellite imagery. Dan Bielefeld talks about how the Transitional Justice Working Group tries to shed light on North Korea's crimes against humanity. Photo by Paul Brown, distributed under the CC0 license. Although the topic of the suffering of North Koreans is grim, there is a silver lining, says Dan: One day there will be a transition, there will come a day when the Kim regime will end and North Koreans will regain the freedom that they have been denied for over 70 years. The work of the Transitional Justice Working Group will also help with that. Finding out what happened to loved ones and bringing those responsible for the atrocities to justice will be a crucial part of helping the nation heal. And it makes sense, says Dan, for the Transitional Justice Working Group to work with both Free Software and Free Software communities. The software offers the group a degree of security and control they cannot find in closed source applications; and Free Software communities uphold the same values Dan's group is fighting for, that is, the right to privacy and personal freedom. Quite appropriately, after Dan's keynote, Adriaan de Groot ran a panel where members discussed the matter of privacy. Developing privacy-respecting software is one of KDE's main goals and the panelists explained how developing free and open Personal Digital Assistants like Mycroft was crucial to protecting users from snooping corporations. Another thing we rarely think about but is a source of concern with regard to personal information is trip planners. In actual fact, the amount of sensitive information that we unwittingly share by letting opaque apps tell us when and where to catch our flight is staggering. Since the 2017 Randa sprint, there are KDE developers actively working on a truly open and private solution that will help solve this problem. The other thing the panel discussed was the state of GnuPG in Kmail. GnuPG is the framework that allows users to encrypt and decrypt email messages that, otherwise, would be sent in clear text -- a big privacy concern. At this stage of play, GnuPG is tightly integrated into Kmail and, is not only convenient for end users, but has also proved to be immune to recent vulnerabilities that have affected other email clients. Combined with the underlying policy of all KDE apps of never collecting data subvertly or otherwise, KDE is sticking strictly to its goal of preserving user privacy. Neofytos Kolokotronis talked about the progress of another of KDE's main goals, namely the onboarding of new users. Neofytos explained to attendees the progress the working group had made so far and where they wanted to go to. 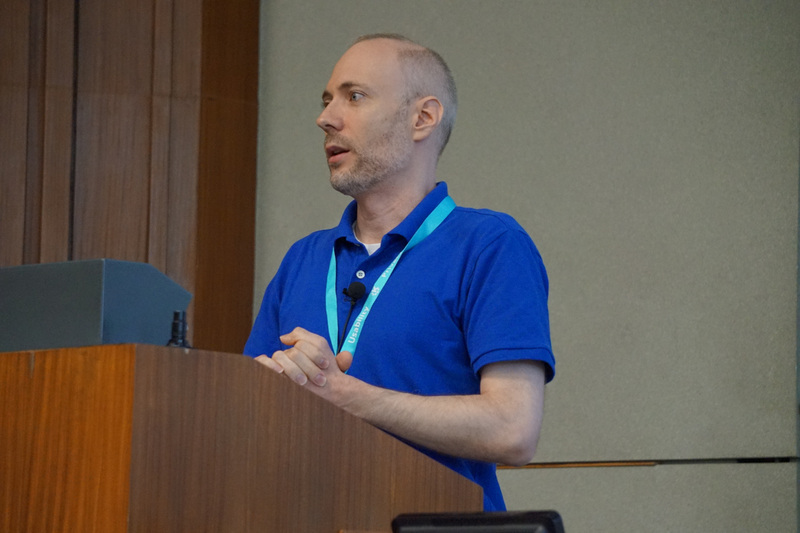 He had some advice on how to help new users join KDE, such as having good and clear documentation, mentoring new contributors, and building connections outside your immediate niche. Wrishiraj Kaushik in his talk titled Winds of Change - FOSS in India spoke about the current scenario of FOSS in India and his experience leading SuperX and integrating KDE with it. The Indian union government has a nation-wide recommendation in place for the use, promotion and development of Free and Open Source software. Despite this, FOSS adoption has remained low in the country. The decision taken by some state governments to not adopt these recommendations in conjunction with the aggressive marketing carried out by proprietary software vendors in India has seriously hindered the use of Free Software. SuperX, however, has managed to find a place within the government and a few Indian universities thanks to its user-centric approach. SuperX has deployed 30,000 KDE shipments -- one of the largest deployments in the world, and there are 20,000 more in the works. This was followed by a panel discussion by Lydia, Valorie and Bhushan in which they told the community about our KDE student programs and how to contribute to their running and up-keep. It was a talk of high relevance, given our KDE Community goal to streamline the onboarding process for new contributors and the fact that a large part of our new contributor base comes through our organized mentoring programs, namely Google Summer of Code, Google Code-in and Season of KDE. Mirko Boehm presented a talk on the genesis of Quartermaster, a toolchain driven by Endocode and supported by Siemens and Google. Quartermaster implements industry best practises of license compliance management. It generates compliance reports by analysing data from the CI environment and building graphs for analysis, primarily performing a combination of build time analysis and static code analysis. Lays Rodrigues showed off Atelier, the graphical interface for 3D printers. Photo by Paul Brown, distributed under the CC0 license. Lays Rodrigues talked about Atelier, a cross-platform program designed to help you control your 3D printer. It supports most printers with open source firmware and Lays demoed the various features of Atelier during her talk, including video monitoring of the printer, 3D preview of the print design, temperature graphs and more. Zoltan Padrah gave a talk on KTechLab and explained how he discovered it as a student of electronics engineering in 2008. KTechLab is a program that helps simulate electronic circuits and programs running on microcontrollers. It was migrated to the KDE infrastructure and joined KDE in 2017. The developers' upcoming plans are to release KTechLab for Qt4 and Qt5 and to port it to KDE Frameworks 5, as well as add new features like support to simulate automation systems for mechanics and have KiCad import/export. Day one was so full of content, it is hard to summarize everything that went on here. This has just been a summary of a few of the talks and demonstrations we enjoyed. There were many more talks on all topics, ranging from containerizing KDE's graphical apps, to an end users' perspective of using Kontact in a professional environment. As we write this, already on day 2, it looks like today is shaping up to be equally exciting. Claudia Garad, Executive Director of Wikimedia Österreich: "We want to create a welcoming atmosphere for newcomers"
Claudia Garad, Executive Director of Wikimedia Österreich. Photo by Stepro. 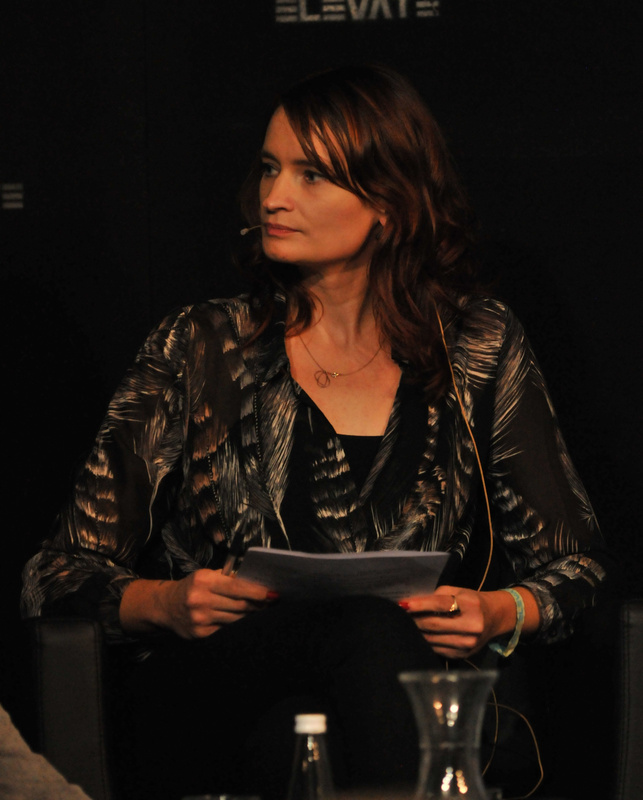 Claudia Garad is the Executive Director of Wikimedia Österreich, Wikipedia's Austrian chapter. Claudia will deliver Akademy's second keynote on Sunday, 12th of August. Claudia graciously met up with us (Ivana and Paul) to tell us all about her job, how the Wikipedia community works and the challenges it faces. Paul: Welcome, Claudia, and thank you for joining us! Paul: So you are the Executive Director of Wikimedia Foundation Austria, correct? Paul: Thanks for the clarification. Tell us... What led you to this job? Did you do something similar before? Claudia: I used to work as Head of Marketing and Communication for a major applied science organization in Germany. We were pioneers in the field of online science communication in the German-speaking world. Beyond the focus on online communication, I think the common denominator of those two jobs is making knowledge accessible. Paul: Of course. What does a typical day at Wikimedia look like for you? What do you do there? Claudia: I'm not sure I have a typical day. We work closely with volunteers, so our working hours vary. We often work in the evenings or on weekends when our Wikimedians are available. I also not only work from our office, but frequently remote when I travel for work. Paul: So do you oversee their work? Make sure the rules for editing articles are respected? Organize events? All of the above? Claudia: Wikimedia staff does not intervene into the work on the Wikimedia projects. The community decides about the rules and how to enforce them; we do not have any direct influence there. But the task that follows me everywhere and at any time is to secure funds for our organization, i.e. fundraising, grant-making and reporting. Apart from that, one of my main tasks is to build partnerships within the Wikimedia movement, but also beyond. With like-minded communities, cultural institutions, potential donators, and so on. Ivana: I take it that you face the challenge of working with people from different time zones. Could you share some advice or tools that you use to overcome scheduling issues? Claudia: I don't think we have super-innovative approaches in that regard. For us in Austria, it's mainly Europe and the US so far, and we found the time slots that work for most. I think the Wikimedia Foundation has probably more refined ideas, as they work with a more diverse group, but I wouldn't know the details. Paul: Talking of diverse, I understand you also deal with diversity and inclusion issues. How do you promote these two things? Claudia: Due to our "hands off" approach, we can only deal with diversity and inclusion issues indirectly: by raising awareness for the topic, encouraging mentorship, fostering solidarity networks among volunteers, and providing incentives and support for all of that. One example is the mentoring program we developed for the Wikimedia Hackathon last year. We wanted to create a welcoming atmosphere for newcomers that is reflected in the physical space, as well as in the social interactions. Paul: Is there a lack of diversity within the Wikipedian community? Claudia: It always depends on the definition of diversity, and it varies between our communities. Speaking for our Austrian communities: it is diverse in some regards, like age, and not very diverse in other, such as gender or ethnical background. Paul: So do you know what percentage of women Wikipedians versus men there are, for example? The percentage for each ethnicity? Is this information you collect? Claudia: There are roughly 10% female contributors in the German-language Wikipedia, and that reflects what I see during offline events. Non-binary is probably around 1-2%. But the numbers are not all 100% accurate, as many volunteers choose not to disclose their gender, and we respect their wish for anonymity. That is even more true for ethnicity - we do not ask for that anywhere. This is what you can get from the information people provide on their user pages. Apart from that, we do not collect any personal data. But there are other ways to make the diversity gaps visible: by comparing the number of biographies about females to the number of articles about men. Wikidata makes that really easy nowadays. Or by looking at the language and perspectives that are represented in articles. It becomes obvious very quickly that we have a problem there, and that should be fixed if we strive to collect "the sum of all human knowledge" as our vision statement says. Paul: How do you solve this problem? Getting back to the activity you mentioned before, for example - how do you make a hackathon more welcoming? What do you physically do? 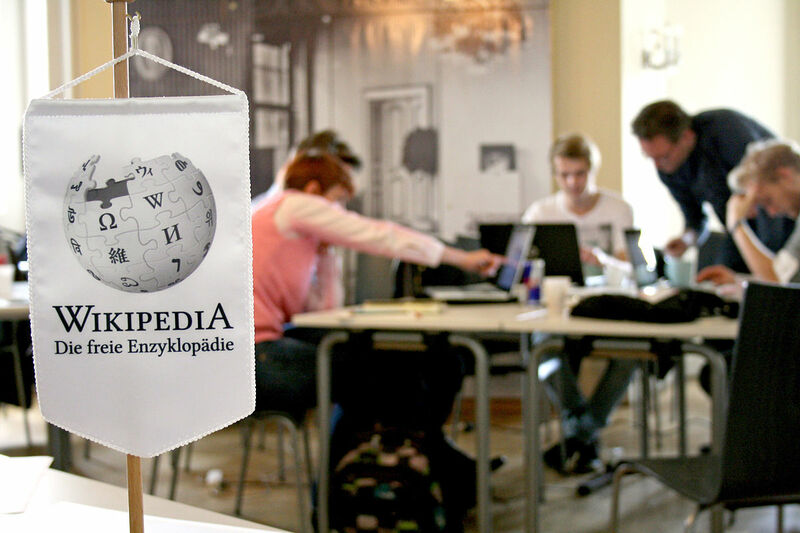 Wikipedia Hackathons implement special activities and spaces to encourage diversity. Photo by Clemens, CC BY-SA 3.0. Claudia: For the first time we had mentors at such an event. Their only job was to help newcomers and to pair them with other newcomers according to common interests. Usually the mentors had project ideas that were suitable for newbies to get started. The aim was that every newcomer could be part of a team that accomplished something during the weekend, and to be able to present a project at the showcase on the last day. To make it as easy as possible to approach people, we also had a mentoring area where people could come at any time to ask questions or get help. Our Austrian community held pre-events, so people could get to know each other in smaller, more intimate surroundings before they were thrown into an international event with 250 strangers. Finally, we had an outreach coordinator who facilitated the mentor-to-mentor and mentor-to-mentees exchange before, during, and after the event. Other ways to make event spaces inclusive are gender-neutral bathrooms, designated "quiet zones" where people can retreat to when they need a break from social interaction, stickers to customize your name badge with information about yourself that can also include how you want to be addressed in terms of gender, etc. Many of these ideas were adapted from a youth hack event called "Jugend Hackt" that is a project of Open Knowledge in Germany and Austria. Ivana: It sounds like you're really taking care of new contributors, which is awesome! It's something we're trying to be better at in our community, too. Could you tell us a bit about the onboarding process - what does it look like when someone new wants to join and start contributing? Are there any "best practices" or recommended ways to get started? Claudia: We learned that the best way to onboard newcomers is regularity; it's hard to achieve much with a single event. So having mentors beyond the event helps, or having regular events or follow-up events, where people can come back to when they encounter barriers. It can be further assisted with social media - chat groups and the like. Places where people can find help and advice on short notice online. Ivana: Have you had any students or new contributors join Wikimedia Österreich through mentorship projects like Outreachy, Google Summer of Code or similar? Do you organize similar programs on a local scale, i.e. in the German-speaking communities? Claudia: We have had newcomers join via local mentoring programs, but not via the global programs you mentioned. Ivana: Do you have something like a list of "junior jobs" or easy tasks that newcomers can immediately tackle? Or if you've tried a similar approach in the past, can you tell us how that worked? Ivana: Getting back to the topic of helping newcomers, you mentioned potential barriers they can encounter. In your experience, what are the most common barriers, or obstacles that newcomers have reported? And how have you worked on resolving them? Claudia takes part in the "Internet Policies and Activism in Europe" panel at the Elevate Festival 2016. Claudia: I think for most newcomers the hardest part is to see where they could help and how. So the task list and mentors can help with that. However, we also still have room for improvement: After the hackathon, many newcomers complained about how long it took to get a code review. Often keeping people engaged after an event is the hardest part. For newcomers and mentors alike. In the end, it is a question of resources. If we want new people, and especially underrepresented people, we will have to invest resources into this endeavour. Half-assed approaches usually don't work in the long run, and I'm afraid that this is something we still have to internalize as a movement. Paul: What about problems from the old-timers? Is there any resistance from the existing community towards the effort to promote more diversity? Claudia: Of course there are parts of the community who are indifferent, and some who openly work against such topics. So the art is to find the people who support the idea and include them, to address justified concerns, and ignore, or if there is no other way, get rid of people that display toxic behavior. Paul: What sort of problems do you see a lack of diversity causing? Claudia: For Wikipedia it is clear: the sum of all knowledge can not be gathered and represented by a small homogeneous group. Furthermore, quality and objectivity of knowledge are also important values in our movement that can only be achieved by including diverse perspectives. Paul: For somebody who wanted to join in the Wikipedia effort... What advice would you give them? What should they read? Where can they start? Claudia: Most Wikipedias have extensive guides on how to get started. Too extensive sometimes :-). I would see whether there is a mentoring program on your Wiki project and sign up, or whether there are local Wiki meet-ups in your home town. In Vienna, for example, we have a Wikipedia clinic for newcomers every first Tuesday of the month. Paul: A Wikipedia clinic! What do you do there? Claudia: It's basically where you can come to discuss and find help for common problems. I think there are code clinics at some events too. It's a peer approach to exchange best practices around common issues or challenges. Paul: Is there a trend? Like problems that new contributors come up with again and again? If so, what are they? Claudia: I think the challenges for newcomers vary between the projects. In the German language Wikipedia, the biggest issues are certainly the complexity that results from an elaborate rule set to ensure quality of content; the fact that most topics of general knowledge are fairly well covered so you need to find your expert niche to contribute; and the often not very newcomer-friendly atmosphere and aggressive interactions. Paul: I suppose people feel possessive about what they work on. Is there any sort of regulatory body that helps resolve disputes or reprimands antisocial behavior? Claudia: There are community-elected arbitration committees to solve conflicts on projects. But in some cases, especially when there is also offline harassment involved, the Wikimedia Foundation has to take steps to ban those people from events, the projects, or both in order to protect others. Moving on to happier topics. Apart from actually writing or expanding Wikipedia articles, what are other things contributors can do to help Wikipedia grow and thrive? Claudia: Other ways to contribute to Wikipedia are to help build the software behind MediaWiki, or to take freely licensed pictures for Wikipedia & Co and upload them to Wikimedia Commons. There are also all the other sister projects such as Wikivoyage, Wiktionary, or Wikidata. Paul: I guess donations also help, right? Where can we go and donate? Claudia: Of course - to keep Wikipedia ad-free and independent, that is probably the easiest way to contribute. You can either donate to the Wikimedia Foundation, that distributes the money among the global communities or, if there is one, to your local Wikimedia organisation. Paul: Claudia, thank you so much for your time. Ivana: And we look forward to your keynote at Akademy! Claudia: Thanks! Looking forward to meeting you in person! Claudia will be delivering the keynote at Akademy 2018 on the 12th of August. Come to Akademy and find out live how you too can make your community more diverse and inclusive. You can join us by registering for Akademy 2018. Registrations are now open. For more information, please contact the Akademy Team. Read more about Claudia Garad, Executive Director of Wikimedia Österreich: "We want to create a welcoming atmosphere for newcomers"
The organization of this year's Akademy is in full swing: the official conference program is out, we have had an insightful interview with one of the keynote speakers, another is coming soon, and attendees are already booking flights and accommodation. The #akademy IRC channel on Freenode and the Telegram group are buzzing with messages, advice and recommendations. That said, it's not too early to start planning for Akademy 2019! In fact, we are now opening the Akademy 2019 Call for Hosts, and looking for a vibrant spot and an enthusiastic crew that will host us. Would you like to bring Akademy, the biggest KDE event, to your country? Read on to find out how to apply! In 2005, Akademy took place in beautiful Málaga, Spain. Photo by Paolo Trabbatoni. 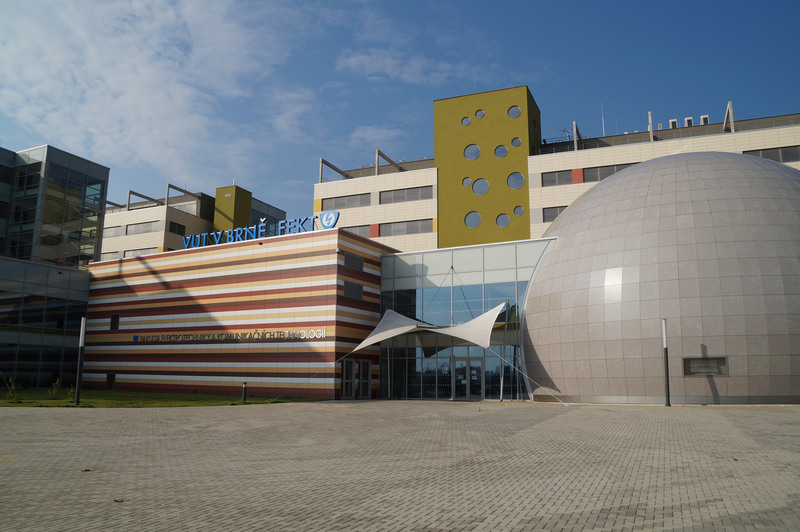 The venue of Akademy 2014 in Brno, Czech Republic. Akademy is KDE's annual get-together where our creativity, productivity and community-bonding reach their peak. Developers, users, translators, students, artists, writers - pretty much anyone who has been involved with KDE - will join Akademy to participate and learn. Contents will range from keynote speeches and two days of dual track talks by the FOSS community, to workshops and Birds of a Feather (BoF) sessions where we plot the future of the project. The first day serves as a welcoming event. The next two days cover the keynote speakers and other talks. The remaining days are used for BoF sessions, intensive coding and workshops for smaller groups of 10 to 30 people. One of the workshop days is reserved for a day trip, so the attendees can see the local tourist attractions. Hosting Akademy is a great way to contribute to a movement of global collaboration. You get a chance to host one of the world's largest FOSS communities with contributors from across the globe, and witness a wonderful week of intercultural collaboration in your home town. You'll get significant exposure to the Free Software community, and develop an understanding of how large projects operate. It is a great opportunity for the local university students, professors, technology enthusiasts and professionals to try their hand at something new. Belgium for this cool group photo. Akademy requires a location close to an international airport, with an appropriate conference venue that is easy to reach. Organizing Akademy is a demanding task, but you’ll be guided along the entire process by people who’ve been doing it for years. Nevertheless, the local team should be prepared to invest a considerable amount of time into organizing Akademy. For detailed information, please see the Call for Hosts. Questions and applications should be addressed to the Board of KDE e.V. or the Akademy Team. We look forward to your ideas, and can't wait to have fun at Akademy 2019 in your city! Akademy 2018 organisers have published the program for the conference part of the event. This year the event will be held in Vienna, and talks will take place on the 11th and 12th of August. On the 11th, the keynote speaker will be Dan Bielefeld, an activist working for a South Korean NGO, who will be talking about how they use technology to expose atrocities committed by the North Korean regime. On a slightly lighter note, Lydia Pintscher and Bhushan Shah will host a panel discussion between the KDE Community and KDE Student programs team on how to recruit new contributors; Ivana Isadora Devcic will tell us of the five ways in which release notes can be made better; Timothée Giet will try to answer the question of how to improve the experience for all kinds of media creators coming to GNU/Linux and the Plasma Desktop; and Lays Rodrigues will explain how Atelier offers a solution to control many 3D printers easily; among many other things. On the 12th we'll delve deep into AI assistants on the desktop with Aditya Mehra's talk on his implementation of the Mycroft AI. A little later, Thomas Pfeiffer will be telling us about how to carry out low-cost, low-effort user testing to improve KDE's products by using Guerilla Usability Testing; Attila Szollosi will bring us up to date on the topic of Linux on mobile with his presentation on postmarketOS; and, talking of embedded, Volker Krause will present the current state of KDE Frameworks packages for Yocto. Of course, there will be plenty of talks about apps, from video-editing with Kdenlive, to music collating with VVAVE, and image management with DigiKam. The rest of the week will be taken up by BoF sessions, workshops and sprints, in which KDE community members will be working elbow-to-elbow and learning from each other, intent on building a better KDE for everybody. Registration for Akademy 2018 is now open, and don't forget to book your accommodation soon, as Vienna is a busy location. Besides, if you book by email and use our discount code, you will be able to get rooms close to other Akademy participants and truly enjoy this one-of-a-kind community event. For most of the year, KDE—one of the largest free and open software communities in the world—works on-line by email, IRC, forums and mailing lists. Akademy provides all KDE contributors the opportunity to meet in person to foster social bonds, work on concrete technology issues, consider new ideas, and reinforce the innovative, dynamic culture of KDE. Akademy brings together artists, designers, developers, translators, users, writers, sponsors and many other types of KDE contributors to celebrate the achievements of the past year and help determine the direction for the next year. Hands-on sessions offer the opportunity for intense work bringing those plans to reality. The KDE Community welcomes companies building on KDE technology, and those that are looking for opportunities. For more information, please contact The Akademy Team. Dan Bielefeld speaks at a Transitional Justice Working Group event. Dan Bielefeld is an activist that works for a South Korean NGO. 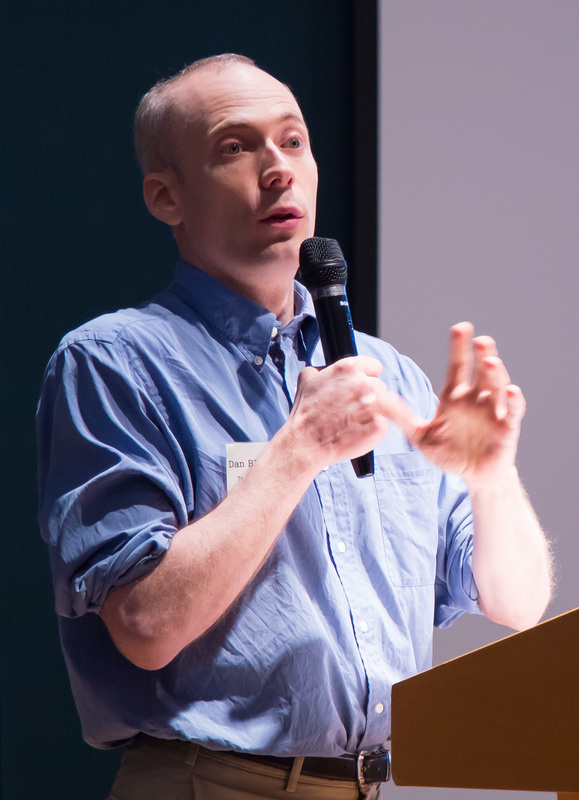 Dan worked in the Washington, D.C. area training young activists in the areas of politics and journalism before going into researching atrocities committed by the North Korean regime. He is currently the Technical Director of the Transitional Justice Working Group and helps pinpoint the locations of mass burial and execution sites using mapping technologies. Dan will be delivering the opening keynote at this year's Akademy and he kindly agreed to talk to us about activism, Free Software, and the sobering things he deals with every day. Paul Brown: Hello Dan and thanks for agreeing to sit down with us for this interview. Dan Bielefeld: Thanks for the opportunity, Paul. Paul: You work for the the Transitional Justice Working Group, an organization that researches human rights violations of the North Korean regime, correct? Dan: Yes, we have a mapping project that tries to identify specific coordinates of sites with evidence related to human rights violations. Paul: And you were a web designer before joining the organization... I've got to ask: How does one make the transition from web designer to human rights activist? Dan: I was a web developer for several years before moving to Korea. When I moved here, I enrolled as a Korean language student and also spent most of my free time volunteering with North Korean human rights groups. So, unfortunately, that meant putting the tech stuff on hold for a while (except when groups wanted help with their websites). Paul: You are originally from the US, right? Paul: Was this a thing that preoccupied you before coming to Korea? Dan: I initially came on a vacation with no idea that I'd one day live and work here. In the lead-up to that trip, and especially after that trip, I sought out more information about Korea, which inevitably brought me repeatedly to the subject of North Korea. Most of the news about North Korea doesn't grab my attention (talking about whether to resume talking, for instance), but the situation of regular citizens really jumped out at me. For instance, it must've been in 2005 or so that I read the book The Aquariums of Pyongyang by a man who had literally grown up in a prison camp because of something his grandfather supposedly did. This just didn't seem fair to me. I had thought the gulags where only a thing of history, but I learned they still exist today. Paul: Wait... So people can inherit "crimes" in North Korea? Dan: They call it the "guilt-by-association" system. If your relative is guilty of a political crime (e.g., defected to the South during the Korean War), up to three generations may be punished. Dan: For a long time I thought it was just North Korea, but I have since learned that this logic / punishment method is older than the division of the North and South. For a long time after the division, in the South it was hard to hold a government position if your relative was suspected of having fled to the North, for instance. Paul: What's your role in Transitional Justice Working Group? Dan: I'm the technical director, so I'm responsible for our computer systems and networks, which includes our digital security. I also manage the mapping project, and I am also building our mapping system. Paul: Digital security... I read that North Korea is becoming a powerhouse when it comes to electronic terrorism. How much credibility do these stories have? I mean, they seem to be technologically behind in nearly everything else. Dan explaining the work of the The Transitional Justice Working Group to conference attendees. Photo by David Weaver. Dan: This is a really interesting question and the answer is very important to my work, of course. Going up against great powers like the US, the North Korean leadership practices asymmetrical warfare. Guerilla warfare, terrorism, these are things that can have a big impact with relatively little resources against a stronger power. In digital security, offense tends to be easier than defense, so they naturally have gravitated online. Eike [Hein -- vice-president at KDE e.V.] and I went to a conference last year at which a journalist, Martyn Williams of NorthKoreaTech.org said they train thousands of hackers from an early age. The average person in North Korea doesn't have a lot of money and may not even have a computer, but those the regime identifies and trains will have used computers and received a great deal of training from an early age. They do this not only for cyber-warfare, but to earn money for the regime. For instance, the $81 million from the Bangladesh bank heist. Paul: Ah, yes! They did Wannacry too. Paul: Do your systems get attacked? Dan: One of our staff members recently received a targeted phishing email that looked very much like a proper email from Google. The only thing not real was the actual URL it went to. Google sent her the warning about being targeted by state-sponsored attackers and recommended she join their Advanced Protection Program, which they launched last year for journalists, activists, political campaign teams, and other high-risk users. We of course do our best to monitor our systems, but the reality today is that you almost have to assume they're already in if they're motivated to do so. Paul: That is disturbing. So what do you do about that? What tools do you use to protect and monitor your systems? Dan: What I've learned over the last three years is that the hardest part of digital security is the human element. You can have the best software or the best system, but if the password is 123456 or is reused everywhere, you aren't really very secure. We try to make sure that, for instance, two-factor authentication is turned on for all online accounts that offer it -- for both work and personal accounts. You have to start with the low-hanging fruit, which is what the attackers do. No reason to burn a zero-day if the password is "password". Getting people to establish good digital hygiene habits is crucial. It's sort of like wearing a seatbelt -- using 2FA might take extra time every single time you do it, and 99.9% of the time, it's a waste of time, but you'll never really know in advance when you'll really need it, so it's best to just make it a habit and do it every time. Another thing, of course, is defense in layers: don't assume your firewall stopped them, etc. Paul: What about your infrastructure? Bringing things more to our terrain: Do you rely on Free Software or do you have a mix of Free and proprietary? Are there any tools in particular you find especially useful in your day-to-day? Dan: I personally love FOSS and use it as much as I can. Also, being at a small NGO with a very limited budget, it's not just the freedom I appreciate, but the price often almost makes it a necessity. Paul: But surely having access to the code makes it a bit more trustworthy than proprietary blackboxes. Or am I being too biased here? 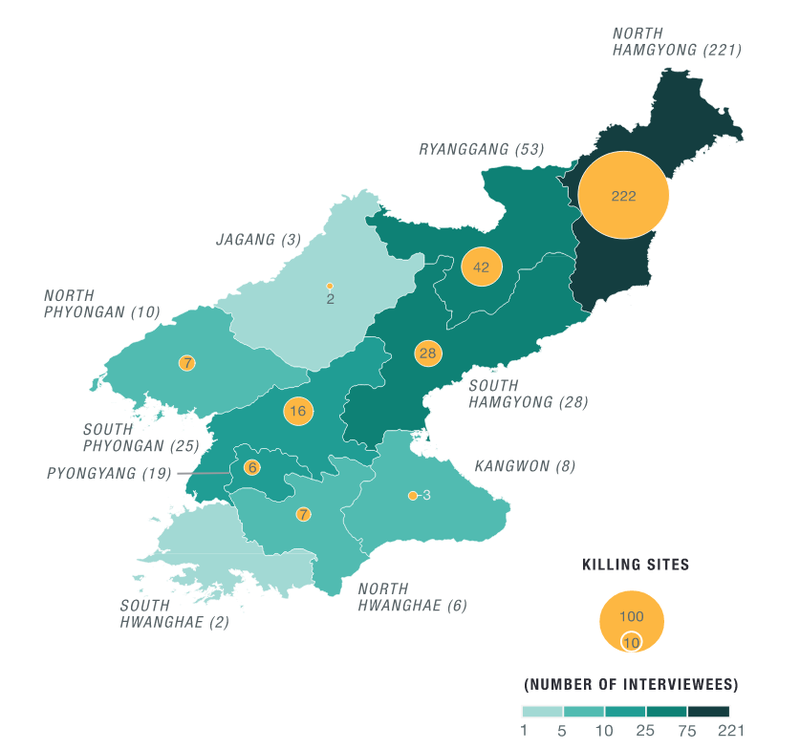 The Transitional Justice Working Group uses QGIS to locate sites of North Korean human rights violations. Dan: Not all of my colleagues have the same approach, but most of them use, for instance, LibreOffice everyday. 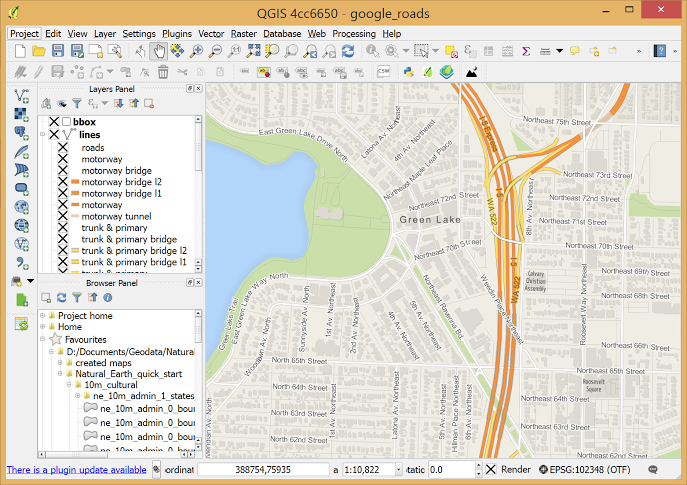 For mapping, we use Postgres (with PostGIS) and QGIS, which are wonderful. QGIS is a massive project that so far we've only scratched the surface of. We also use Google Earth, which provides us with imagery of North Korea for our interviews (I realize GE is proprietary). I agree, though, that FOSS is more trustworthy -- not just for security, but privacy reasons. It doesn't phone home as much! Paul: What about your email server, firewalls, monitoring software, and so on. What is that? FLOSS or proprietary? Dan: Mostly FLOSS, but one exception, I must admit, is our email hosting. We do not have the resources to safely run our own email. A few years ago we selected a provider that was a partner with a FOSS project to run our own email service, but we ultimately switched to Google because that provider was slow to implement two-factor authentication. Paul: Getting back to North Korea's human rights violations, you are mapping burial sites and scenes of mass killings, and so on, is that right? How bad is it? Dan: The human right situation in North Korea is very disturbing and the sad thing is it's continued for 60+ years. The UN's Report of the Commission of Inquiry on human rights in the Democratic People’s Republic of Korea from 2014 is a must-read on the general human rights situation in North Korea. From the principal findings section (para. 24), "The commission finds that systematic, widespread and gross human rights violations have been and are being committed by the Democratic People’s Republic of Korea. In many instances, the violations found entailed crimes against humanity based on State policies." Their mandate looked at "violations of the right to food, the full range of violations associated with prison camps, torture and inhuman treatment, arbitrary arrest and detention, discrimination; in particular, in the systemic denial and violation of basic human rights and fundamental freedoms, violations of the freedom of expression, violations of the right to life, ... enforced disappearances, including in the form of abductions of nationals of other States," and so on. For our mapping project, we published our first report last year, based on interviews with 375 escapees from North Korea who have now settled in South Korea. They collectively told us the coordinates of 333 killing sites, usually the sites of public executions, which local residents, including school children, are encouraged and sometimes forced to watch. It should be noted that this number hasn't been consolidated to eliminate duplicates. Some people reported more than one site, others none at all, but on average, almost one site per person was reported. Paul: And how do you feel about the situation? I am guessing you have met North Korean refugees passing through your workplace and that you, like most of us, come from a very sheltered and even cushy Western society background. How do you feel when faced with such misery? Suspected killing sites per province. Dan: It's a good question and hard to put into words what I feel. I guess, more than anything, I find the North Korean regime so unfair. Those we met in Seoul have been through so much, but they also are the ones who overcame so many obstacles and now have landed on their feet somewhere. It's not easy for them, but usually the longer they're here, the better they end up doing. Continuing about the mapping project's first report findings, from those 375 interviewees, we were also told the coordinates of 47 "body sites" - we use the term "body sites" because it's more general than burial sites. Most of the sites were burial sites, but some were cremation sites or places where bodies had been dumped without being buried, or stored temporarily before being buried. This 47 figure IS consolidated / de-duped (from 52), unlike the killing sites number. Dan: We manually plot them using Google Earth, yes. During the interview, our interviewer (who himself is originally from the North) looks together with the interviewee at Google Earth's satellite imagery. You have to get used to looking down at the world, which takes some getting used to for some people. Paul: Is there no technology that would help map these things? Some sort of... I don't know... thermal imaging from satellites? Dan: Our goal eventually would be to interview all 30,000-plus North Koreans who've resettled in South Korea. The more we interview, and the more data points we get, the more we can cross-reference testimonies and hopefully get a better picture of what happened at these locations. 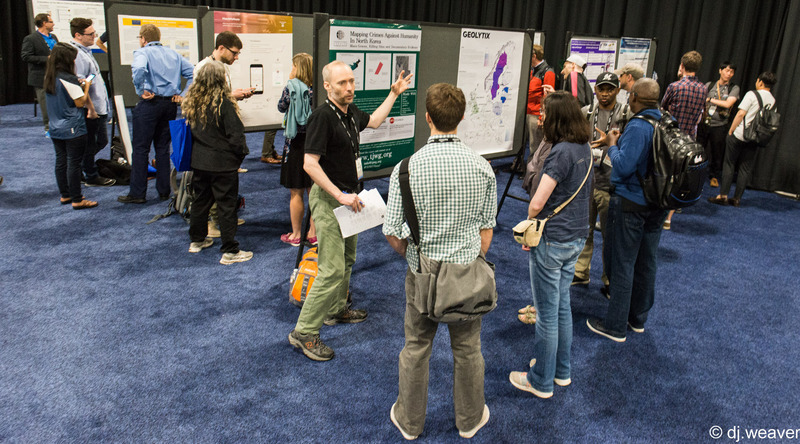 I went to the big FOSS4G (G=Geospatial) conference last year in Boston and also the Korean FOSS4G in Seoul, and got to meet people developing mapping systems on drones. The only problem right now with drones is that flying them over North Korea will probably be seen as an act of war. When we get enough data points, we could use machine learning to help identify more potential burial sites across all of North Korea. Something similar is being done in Mexico, for instance, where they predict burial sites of the victims of the drug wars. Dan: Patrick Ball of the Human Rights Data Analysis Group is doing very, very good stuff. Dan: Very true, that. North Korea is very good at playing divide and conquer. The rivalry between the Soviets and the Chinese, for instance, allowed them to extract more aid or resources from them. They also try to negotiate one-on-one, they don't want to sit down to negotiate with the US and South Korea at the same time, only with one or the other, for instance. North Korea - South Korea and North Korea - US meetings are dramatically being planned right now, and it puts a lot of stress on the alliance between the US and South Korea. That's definitely a goal of North Korea's leadership. Again, divide and conquer. So one thing that's an absolute must is for South Korea to work very closely with other countries and for them to all hold to the same line. But there are domestic and external forces that are pulling all of the countries in other directions, of course. I would say to any government to always keep human rights on the agenda. This does raise the bar for negotiations, but it also indicates what's important. It also sends an important message to the people of North Korea, whom we’re trying to help. I also think strategies that increase the flow of information into, out of, and within North Korea are key. For instance, the BBC recently opened a Korea-language service for the whole peninsula including North Korea. And Google’s Project Loon and Facebook’s similar project with drones could theoretically bring the internet to millions. Paul: Do you think these much-trumpeted US - North Korean negotiations will happen? And if so, anything productive will come from them? Dan: I really don't know. Also, one can't talk about all this without mentioning that China is North Korea's enabler, so if you want to significantly change North Korea, you have to influence China. To more directly answer the question, two US presidents (one from each party) made big deals with the North Koreans but the deals fell apart. We’ll see. Paul: We've covered what governments can do, but what can private citizens do to help? Dan: One major thing is to help amplify the voices of North Korean refugees and defectors. There are a few groups in Seoul, for instance, that connect English speakers with North Korean defectors who want to learn and practice their English. There are small North Korean defector communities in cities like London, Washington DC, etc. I don't know about Berlin, but I wouldn't be surprised! That's at the individual-to-individual level, but also, those with expertise as software developers, could use their skills to empower North Korean refugee organizations and activists, as well as other North Korean human rights groups. Paul: Empower how? Give me a specific thing they can do. Dan: For instance, one time I invited an activist to the Korea KDE group. He and some KDE community leaders had a very interesting discussion about how to use Arduino or something similar to control a helium-filled balloon to better drop leaflets, USB sticks, etc. over North Korea. Paul: That is a thing? What do the Arduinos do, control some sort of rotor? Dan: I can't really get into specifics, but, speaking of USB sticks with foreign media and content on it, one group has a project to reuse your old USB sticks and SD cards for just that purpose. Paul: What do you put on the sticks and cards? "The Interview"? "Team America"? Paul: Dan, thank you so much for your time. Dan: Thanks so much, Paul, I look forward to meeting you and the rest of the KDE gang this summer. Paul: I too look forward to seeing you in Vienna. Dan will be delivering the opening keynote at Akademy 2018 on the 11th of August. Come to Akademy and find out live how you too can fight injustice from the realms of Free Software. For most of the year, KDE—one of the largest free and open software communities in the world—works on-line by email, IRC, forums and mailing lists. Akademy provides all KDE contributors the opportunity to meet in person to foster social bonds, work on concrete technology issues, consider new ideas, and reinforce the innovative, dynamic culture of KDE. Akademy brings together artists, designers, developers, translators, users, writers, sponsors and many other types of KDE contributors to celebrate the achievements of the past year and help determine the direction for the next year. Hands-on sessions offer the opportunity for intense work bringing those plans to reality. The KDE Community welcomes companies building on KDE technology, and those that are looking for opportunities. You can join us by registering for Akademy 2018. Registrations open in April. Please watch this space.